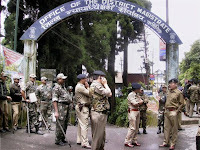 A home guard was set on fire in Darjeeling town on Friday where incidents of arson were reported on the eve of the indefinite bandh called in the hills to demand a separate state of Gorkhaland on the lines of Telangana. The home guard was set on fire at Pokhriabong by unidentified people, police said, adding he was hospitalized. A forest bungalow at Takdha, where West Bengal Chief Minister Mamata Banerjee had put up during a visit to Darjeeling on January 9 this year was burnt down on Thursday night, the sources said. A truck and a SUV were torched at Mongpo, while police booths, which were not in use at Ranglirangliyat and Rangamancha, were set ablaze on Thursday night, the sources said. GJM General Secretary Roshan Giri, who left for Delhi as the head of a six-member team, told reporters before his departure that the GJM was not responsible for the incidents of arson and put the blame on opposition parties in the hills. He said that the indefinite bandh could be relaxed for a day or two for which GJM President Bimal Gurung would be consulted. Superintendent of Police Kunal Agarwal said that one company of the CRPF arrived yesterday and four more battalions would arrive in the hills. Besides the CRPF, there were two battalions of the Indian Reserve Force, five battalions of the riot police and seven battalions of the Rapid Action Force stationed in the hills. Students from some schools in Darjeeling town have been sent home. Rector of St Paul’s Joy Halder said that of the 530 students, 430 were Indian, while the remaining 100 from France, Canada, Bangladesh, Bhutan and Thailand were yet to be sent back. With people stocking up for the indefinite bandh, vegetables from Siliguri sent in 60 to 70 trucks were sold out by 10:00 AM at the Chowkbazar, Sukhipokri bazar and Sonanda bazar, vendors said. The vendors said that rice which is normally sold for Rs 2,400 to Rs 2,600 per 100 kg was being sold at Rs 3,200. The vendors said that kerosene was also unavailable, though LPG, which had been exempted from the purview of the bandh, was available.